Pearl was next in line for the Aggies, if Stew Morrrill hadn’t moved from Colorado State. Vacationing in Florida, Bruce Pearl fielded the phone call that almost changed his life. Utah State needed a basketball coach, and the school’s athletic director wanted to know if Pearl would be interested in moving from Division II Southern Indiana to Logan. Pearl’s recollections are partly accurate. Morrill enjoyed a remarkable, 17-year tenure at Utah State. Yet if not for Morrill’s unconventional move from Colorado State of the Mountain West to USU of the Big West in 1998, Pearl would have been the next choice, former Aggie athletic director Bruce Van De Velde said. If Morrill had turned down USU's offer, who knows how long Pearl may have stayed in Logan or how his career arc would have been altered. He undoubtedly would have won a bunch of basketball games, as has happened everywhere he has coached, during a career that could be described only as adventurous. Actually, there may be other labels to summarize it, but this part is undeniable: He’s thriving at Auburn at age 59. The school awarded him a contract extension last summer, even after former associate head coach Chuck Person’s involvement in the federal investigation into bribes paid to families of recruits. 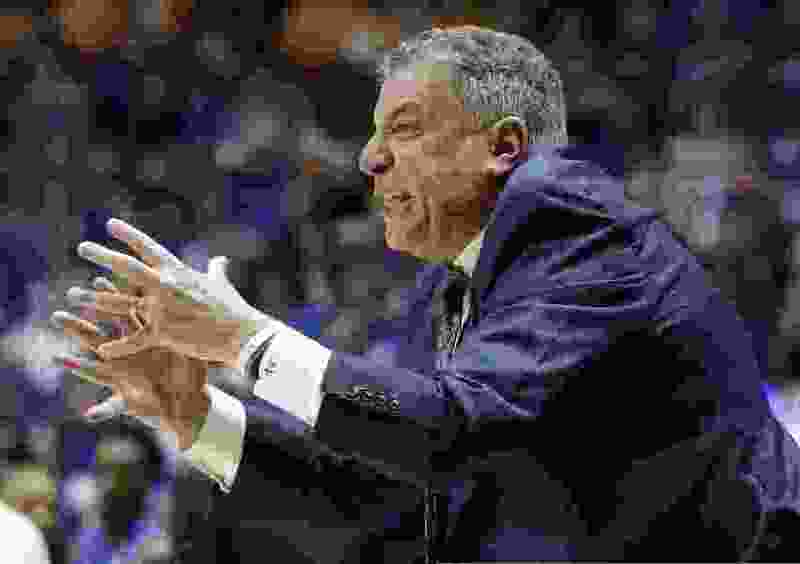 And the Tigers, once downtrodden in the Southeastern Conference, have reached the NCAA Tournament’s second round for the second year in a row, facing No. 4 seed Kansas on Saturday night. Auburn advanced via a 78-77 defeat of New Mexico State, having almost blown a 13-point lead at the end. That's his style, direct and honest, which is a nice way of framing the moments when Pearl jumped onto the court Thursday and got after his players as they came to the bench during timeouts. The obvious difference is Morrill seemingly never even came close to having any NCAA issues in his 29 years as a head coach at three schools. In between Southern Indiana and Auburn came Pearl's successful four-year run at Division I Milwaukee and his six-year stay at Tennessee, where the Volunteers made six NCAA appearances (including three trips to the Sweet 16 or beyond). Tennessee fired him in 2011, amid NCAA sanctions stemming from recruiting violations and a cover-up. Pearl was out of coaching for three seasons; even after being hired by Auburn in 2014, he was not allowed to recruit for five months, serving the NCAA's show-cause penalty. And he’s eager to challenge “maybe the most storied program in the history of college basketball” Saturday, facing Kansas and its Hall of Fame coach, Bill Self. Tipoff: Saturday, approximately 7:40 p.m.
Records: Kansas 26-9; Auburn 27-9. Series history: Auburn leads, 1-0. Last meeting: Auburn 66, Kansas 64 (1985). About the Jayhawks: Kansas overwhelmed No. 13 seed Northeastern in the second half of an 87-53 win Thursday. … Junior forward Dedric Lawson led the Jayhawks with 25 points and 11 rebounds and Kansas shot 55.7 percent from the field (going 19 of 27 in the second half) to the Huskies’ 28.1 percent. Vasa Pusica, Northeastern’s star guard, went 2 of 13. … With a victory, Kansas would advance to the Sweet 16 in Kansas City, likely facing No. 1 seed North Carolina in the Midwest Region. About the Tigers: Auburn lost almost all of a 13-point lead in the final seven minutes Thursday, but held on for a 78-77 win over No. 12 seed New Mexico State. … The Aggies outrebounded Auburn 39-24; no Tiger had more than five boards. … Auburn’s only meeting with Kansas came in the 1985 NCAA Tournament, as Chuck Person scored 21 points in the Tigers’ victory and KU freshman Danny Manning was held to seven points.